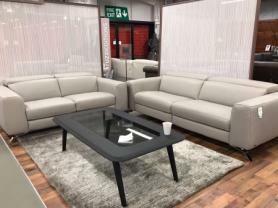 Ancona full Protecta leather all over, very modern and slick design 3 seater power recliner & 3 seater manual recliner with adjustable headrests. Thick thick leather and Grey colour which is most popular. Spacious pocket sprung seating for that extra comfort and high back for plenty of support. Absolutely lovely soft hard wearing and child friendly leather. Adjustable headrests with recliners very modern will enhance the look of any room. Approximate Measurements: 3 Seater: 215 cm.